The Unknown Cook has cooked many a burger. We’ve done Ranch burgers, BBQ burgers, Teriyaki burgers and even Venison burgers. We like to think that we know burgers. But, what we didn’t know was Big Billy’s Burger Joint. Now, for us to cook as much as we do, we do love to eat out when time permits. We had family from the Upstate of South Carolina visiting this weekend and decided collectively that we wanted burgers. Then my son-in-law blurts out, “I don’t want some puny burger. I want a real burger!” Well, that shuts down my thought of where I wanted to go. A couple of places were tossed around and then we settled on Big Billy’s place that my daughter and wife had been to earlier this year. I’ve been to burger joints before. One of my favorite ones was off Murfreesboro Road in Nashville, Tennessee when I lived there years ago. I wonder if it’s still there? Before I became an Unknown Cook, I was known to be sitting in this place three times a week ordering the same burger each time because I knew what I was going to get. Now I’m in Big Billy’s place and don’t know what is going to happen here. After all, I didn’t seek out any reviews before setting out to eat here. I trusted that my wife and daughter knew a good burger when they tasted one and boy were they right! Shelby Hughes and April Distler know a thing or two about what it means to render great service! Two of Billy’s best. and she went to work right away assembling tables and chairs. 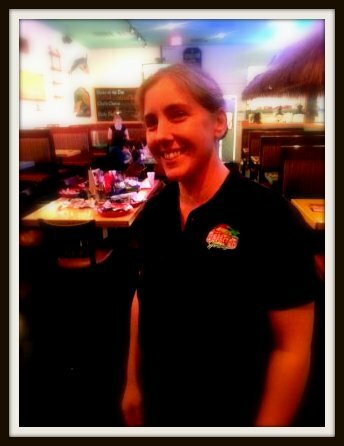 Once we were all settled, our server April approaches the party and introduces herself and made a commitment to take care of us. Wait a second here. This kind of action is far different from my experience at the Tennessee burger joint. There was no hostess or server there. There was a counter, a cashier, and a menu board above head. This brings me to a question. Have burger joints changed the game or has this Big Billy created a new standard in what a burger joint should be? I like where he is going with this I tell you! As April was taking our drink orders, I noticed she wasn’t writing the orders down on a note pad. No! April was selecting our drink and appetizer orders from an iPad. An iPad? Yes, an iPad! Like I said, this isn’t your ordinary burger joint. Billy has harnessed the power of technology to enable his employees and diners to have a great experience. April explained to me that this technology allows her to put in our orders directly from the screen and send to the kitchen instantly. This reduces time from table to kitchen because orders don’t have to be written on a note pad and then input into a POS system to the kitchen. I was most impressed by this implementation of automation in a burger joint. Talk about setting yourself apart from the competition. Cannon Ross has a great group of people under her charge at Big Billy’s Burger Joint in North Charleston. To run an operation like this, we knew it took someone special. A place called Big Billy’s Burger Joint which is actually a top notch operation masquerading as a burger joint needed someone who is sharp and certainly clever to hold it together with superb food and great service. Who was this Billy? We found out that Billy on this night was Cannon Ross who was the manager on duty. Cannon was certainly prettier than any Billy we ever met and we were delighted that she stopped by to visit us. We expressed to her how satisfied we were with the food and service. We think it is always good to let those that labor in our industry know how great a job they do. When our food came out, the presentation was more than what I expected at this place mis-named a burger joint. The arrival of our main courses was in perfect timing as we were just putting the finishing touches on our appetizers. The burgers and all the fixings were fresh. None of us were dissatisfied as we received our plates one by one. The word “wow” seemed to echo around the table. I noticed that on the sheet paper that covered the bottom of our serving dishes also read the name “Noisy Oyster”. We wrote about the Noisy Oyster not long ago. “What is the relationship between Big Billy’s and the Noisy Oyster?” April then clued me in to the fact that Big Billy’s and the Noisy Oyster have the same owner. Well, now! This explains the high level of service and quality of food going on around here. I didn’t have to ask anymore questions. How often does a guy get to take his family out to two great places with different themes owned by the same person? You gotta love Charleston, SC! Here are more pictures of our visit to Big Billy’s Burger Joint. Be sure to visit Big Billy’s Burger Joint’s website for their waist stretching, Belt Buster Challenge and authentic gear that you can own. Thank you to Cannon, April, and Shelby for all your help during our visit. We look forward to seeing you all again. Thank you Mr. or Mrs. Owner for setting a standard of service and food excellence that should be duplicated across the industry! Posted on November 24, 2014, in Uncategorized and tagged best burger joint, best burger restaurant, Best burgers in charleston, best dining for burgers, best dining in charleston, best hamburgers, Big Billy, Big Billy's Burger Joint, bison burger, burgers, hamburgers, lamb burger, Mahi Mahi Soft Taco, Noisy Oyster, ostrich burger. Bookmark the permalink. Leave a comment.